Nitra, one of the oldest Slovak towns, is situated at the crossroads of primeval long-distance routes within the last projections of the Tribeč Mountains, close to a ford across the Nitra River. Inhabited since the Palaeolithic Age, this territory was settled by Slavs in the 5th and 6th centuries and became the political, economic and cultural centre for Slavic tribes north of the Danube River in the 7th century. 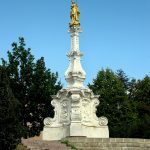 The first written reference to Nitra dates to 826 when the first known ruler of Slavs, Prince Pribina, ruled the independent Principality of Nitra. Pribina was the first known builder of the Christian church on the territory of Slovakia. The Principality of Nitra, attested by numerous findings from several sites in present-day Nitra, was an important frontier duchy and subsequently became part of the Kingdom of Hungary. Some recent findings, for example a column head from the 11th or 12th century from the Benedictine monastery of St. Hippolytus on Zobor hill, which has its origins probably as early as in the 9th century and is the oldest historically documented monastery in Slovakia, are proof of continuous ongoing settlement and culture in the area. The existence of the monastery is also proven by written sources, Zobor documents of 1111 and 1113. The current historical centre is formed by the Upper Town and the Lower Town. For a short period, King Bela IV granted the privileges of a free royal town to the Lower Town of Nitra in 1248, while Nitra Castle and Upper Town remained the property of the Bishopric. The fortified castle with the cathedral became the centre of a settlement. The town below the castle was conquered several times and ruined by Matus Cak in the early 14th century, by the troops of Jan Jiskra of Brandys in 1440 and by the Ottoman occupation in 1663. The subsequent restoration concerned not only the castle and modernisation of its fortifications but also the destroyed Upper and Lower Towns. The renovation of the town in the Baroque style started in the early 18th century after the Rakoczi Rebellion, which also affected Nitra. Pompous Baroque reconstruction of the castle took place in the 17th and 18th centuries and resulted in the complex of the Upper and Lower Churches and the Cathedral of St Emeram, with its oldest part, the Romanesque Church of St Emeram, dating from the 11th century. 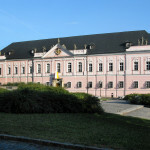 The Bishop’s Palace was built on older foundation between 1732 and 1739. The most important preserved architectonic feature of the castle’s medieval fortifications is the Vazulova veža tower. In the adjacent section of the walls the oldest Slavic mound was found. The Marian column from 1750 dominates the area in front of the castle. It is a reminder of the plague epidemics of 1749. The Classicist Great Seminary with its unique diocesan library was built in the second half of the 18th century in the Upper Town where the originally canonical houses stood. The Provost’s Palace was built in the same period. The construction of the Classicist Small Seminary took place in the 19th century. The Cluch Palace with its corner statue of Atlas, known under the name Corgoň, forms part of the present-day Pribina square. The Upper Town is entered through the underpass of the former Župný dom (County House), which was built in 1903-1908 in the historicising Art Nouveau style. It can also be entered through Horný Palánok street. The Franciscan Monastery with its Baroque style Church of St Peter and Pavol from 1624-1634 is situated near the underpass. The Lower Town, extended along the river in the 1930s to the Neo-Gothic former barracks building and today´s market place, was not as well-designed as the Upper Town. It was devastated by wars, fires and floods. Only two-storey buildings survived up to 1970. A considerable part of its historic buildings also suffered damage during World War Two when the surroundings of the theatre were destroyed. Subsequent clearances in the 20th century also had a devastating effect. The spacious Svätoplukovo námestie square with the modern building of the Andrej Bagar Theatre occupies a dominant position in this part of the town. The Nitra Museum is located in a Neo-Renaissance building dating from 1880-1882. The pedestrian zone on the Štefánikova trieda street follows an ancient thoroughfare, although the majority of its houses were built in the 20th century. The synagogue, built in the Byzantine style in 1911, is a reminder of the once numerous Jewish community documented in Nitra as early as the 11th century. The church towers are the most dominant monuments. 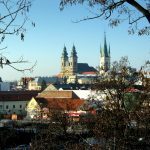 The oldest one is the Piarist Church and Monastery situated in the place of the Slavic settlement, which was built in stages and after 1763 became one of the most remarkable dominant features of the town. The complex of the former Vincent Monastery is situated on Farská street. Its construction began in 1854 on the town’s parcel. The tall, slender tower of the Church of the Visitation of the Virgin Mary is another characteristic dominant feature of the town. The Baroque Church of St Michal was built in the nearby Na vŕšku street in 1739. The originally Romanesque Church of St Stephen is located in the modern Párovce housing estate. Further from the centre is the Calvary, with its late 19th-century Gothic church. It creates the characteristic image of the city. Adjustments of the Nitra river flow in the 1930s provided new space in the centre for creating a number of high-quality contemporary architecture, constructed in accordance with the principles of functionalism. Present-day Nitra, despite its repeatedly enlarged area and modern housing estates built over the last 50 years, has preserved a charming silhouette. The valuable monuments of the Upper Town and the Castle resulted in the declaration of the Town Conservation Reservation on its territory in 1984.